Set exact times or intervals at which appointments can be scheduled. 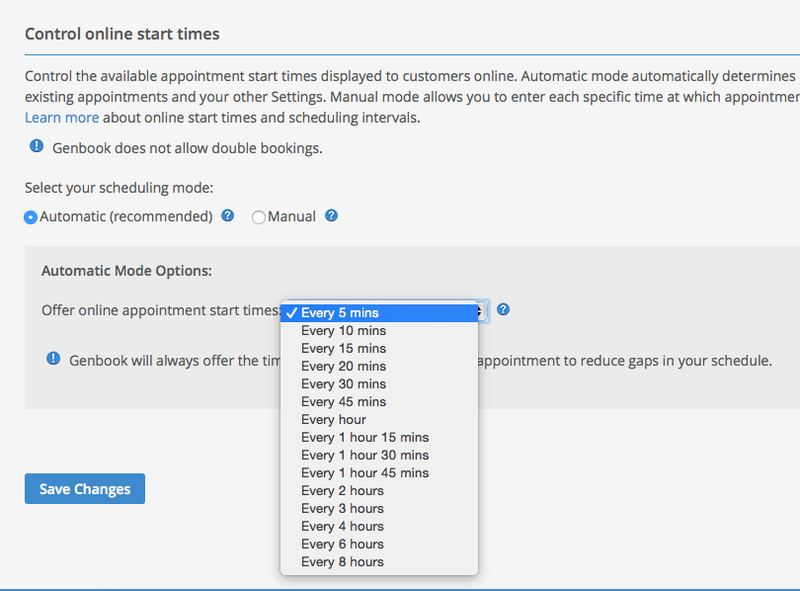 The "Automatic" option allows you to set the times customers see in intervals of anywhere from 5 minutes to 8 hours. Genbook calculates the start time increments based on your business's opening Operating Hour. To use this mode, choose the "Automatic" option, then select the start time increment you'd like to offer. NOTE: There's one exception to the Automatic increment rule. Genbook always displays the very next available time after an appointment, regardless of the incrementation you set, then resumes the incrementation. That next available start time is the end time of your previous appointment. We do this in order to maximize your scheduling capacity. Let's look at an example. Say someone made an appointment for a 20-minute service, at 10:00am. The very next available time would be 10:20, because that's the time at which the previous appointment ended. The next customer looking at your Scheduling Webpage would therefore see 10:20am, then 10:30am, 10:45pm, 11:00am and so on. 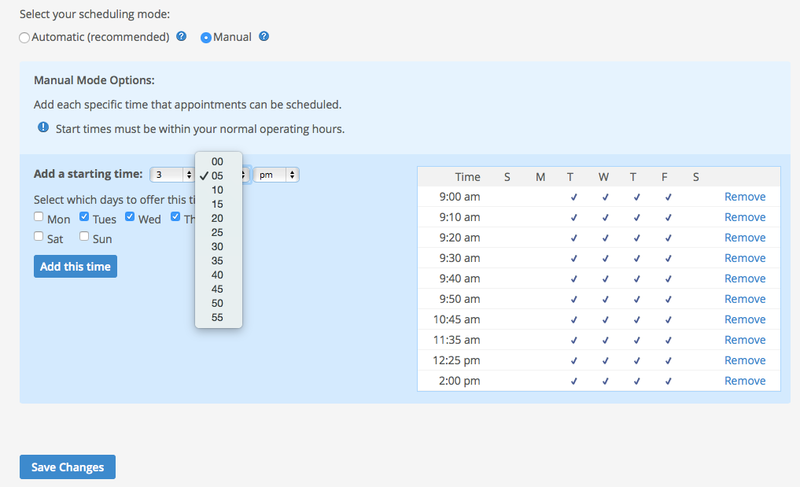 The "Manual" option allows you to enter each specific time at which you wish to have appointments begin. To use this option, select "Manual" under "Set your scheduling mode", then move to the bottom and choose the times you want to add for specific days of the week. Select the time from the drop-down menus, then check the day(s) of the week for which that starting time applies and click "Add this time". NOTE: You must enter every single start time you wish to display because only the times you input will be displayed. This option gives you, the business owner, more control, especially if you'd like to have different start times on different days. Another important thing to remember is that start times will only be displayed if they are within business or staff hours, and there is availability. That's to say that if you set up several start times on a day when your business is closed, customers won't have the option of scheduling on those days, as your Operating Hours outrank Online Start Times. 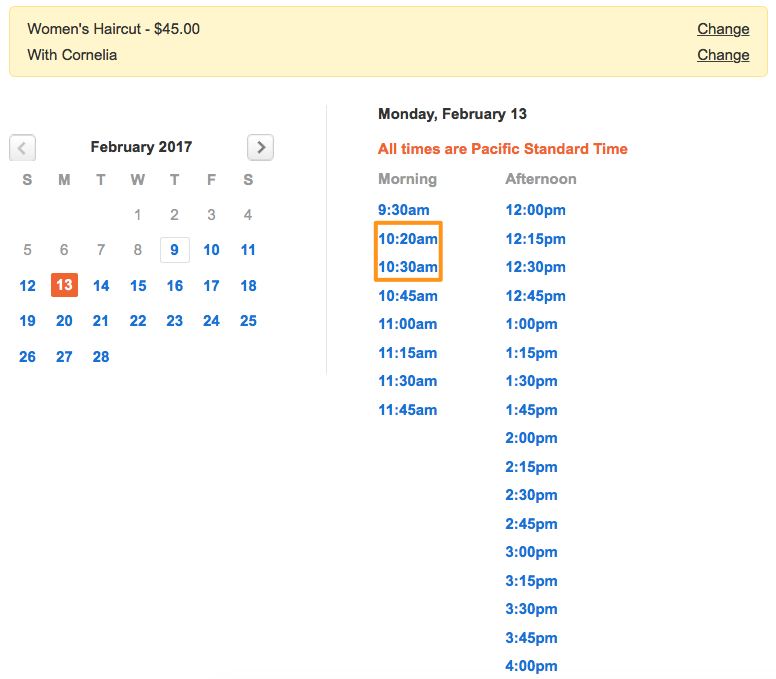 Online Start Times apply only to Online Scheduling. They do not affect the times at which you can place Offline appointments in your Calendar (you can place those wherever you like, as long as they don't overlap another appointment or a Block). Online Start Times are different from Service Durations. Durations dictate how much time an appointment takes up in the Calendar. Manual start times give your business more control over when appointments are scheduled. 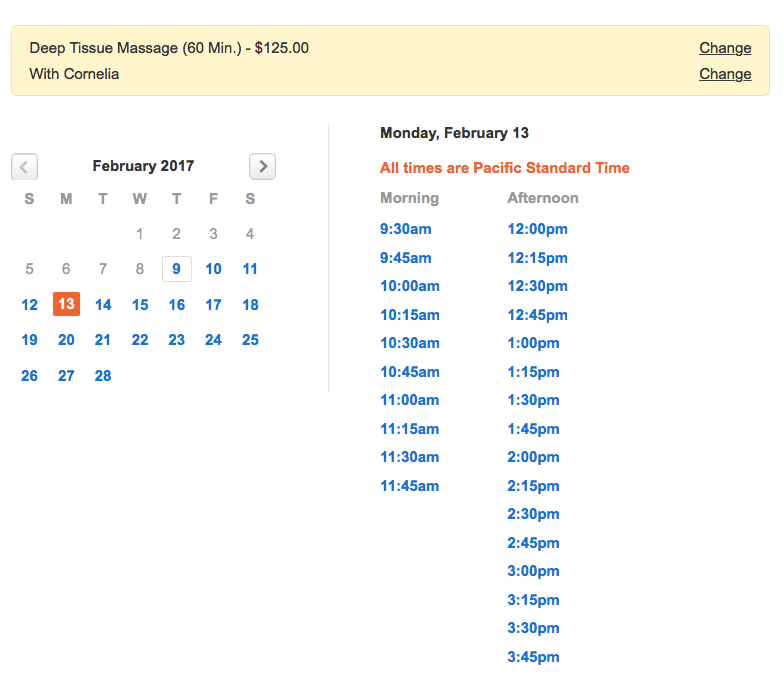 Automatic start times give your customers more choices of appointment times.